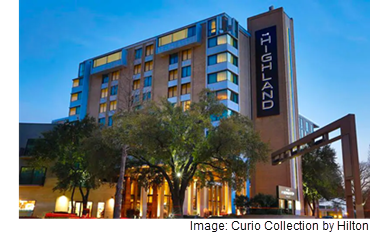 ​​ ​DALLAS – Lennox Capital Partners has acquired the 198-room Highland Dallas Curio hotel at the corner of Mockingbird Ln. and US 75 near SMU. The nine-story hotel opened in 2006 as The Hotel Palomar. It became the Highland Dallas in 2014. The property includes a full-service restaurant, a salon, a fitness center, an outdoor pool, and more than 14,000 sf of meeting space. The previous owners—an affiliate of Brookfield Asset Management Inc.—invested more than $6 million in the property before putting the hotel on the market a few months ago.